Want to make a Michelin-starred chef's recipe at home? This delicious bison tenderloin recipe featuring an ensemble of roasted vegetables in a red wine sauce is totally doable at home! Jean-François Bruel is Executive Chef at the award-winning, two Michelin-starred contemporary French restaurant DANIEL in New York City. He developed this cocotte (casserole) of fall vegetables to complement the rich flavors of the bison tenderloin. 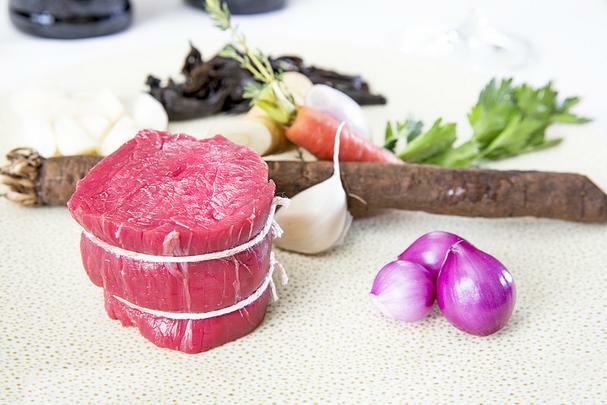 Bison is a sustainable red meat that boasts health benefits such as low cholesterol and low sodium, while providing a significant source of iron and a healthy dose of Omega 3 fatty acids. 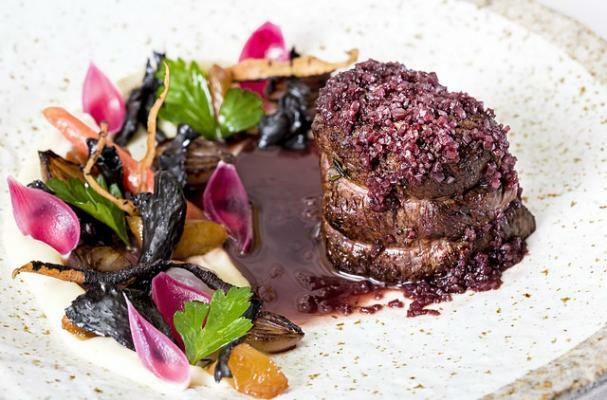 Chef Bruel’s one-of-a-kind dish features roasted parsnips, carrots, salisfy (a root vegetable), pearl onions, wild mushrooms and a shallot red wine sauce that is drizzled around a five-ounce High Plains Bison tenderloin. It's a succulent dish with just a hint of sweetness from the roasted veggies. If you can't find salsify in your market (farmer's markets often will have it), then use more parsnips or toss in artichoke hearts or asparagus. In a small saucepan, bring the red wine and veal stock to a boil and reduce by ¾. In a medium sauté pan set over medium heat, warm a few tablespoons of the olive oil and add 1 T of the butter. Add the red pearl onion, carrot, salsify, and mushrooms. Season with salt and cook on the stovetop, stirring, for about 5 minutes. Transfer to the oven and continue roasting for 20 minutes, tossing occasionally to ensure even cooking. Keep warm on the side. Meanwhile, set a saucepan over medium heat and warm a tablespoon of olive oil. Add ¼ of the minced shallots and cook until translucent. Add the chopped parsnip and cook for 6 minutes, stirring occasionally. Add the milk, season with salt, bring to a simmer, and continue cooking another 10 minutes, or until the parsnip pieces are soft. Transfer to a blender and puree until smooth. Transfer the puree back to the saucepan and keep warm on the side. In a large sauté pan set over medium high heat, warm 3 T of olive oil. Season the bison steaks on all sides with salt and freshly ground black pepper. Sear for 2 minutes on each side, then add 1 T of the butter, garlic, and thyme. Spoon the foamy butter over the steaks for 1 minute each side, and then remove them from pan to a resting rack. In the pan, sauté the remaining shallots until translucent, and add the reduced red wine and veal stock, along with the red wine vinegar, bring to a boil, then remove from the heat. Whisk in the remaining butter, remove the spring of thyme and garlic, and season to taste. Dress the plates with a swipe of parsnip puree, the roasted vegetables and the bison steaks. Generously spoon the sauce over the steaks and garnish with the parsley leaves.